What’s one of the most badass things you can do? 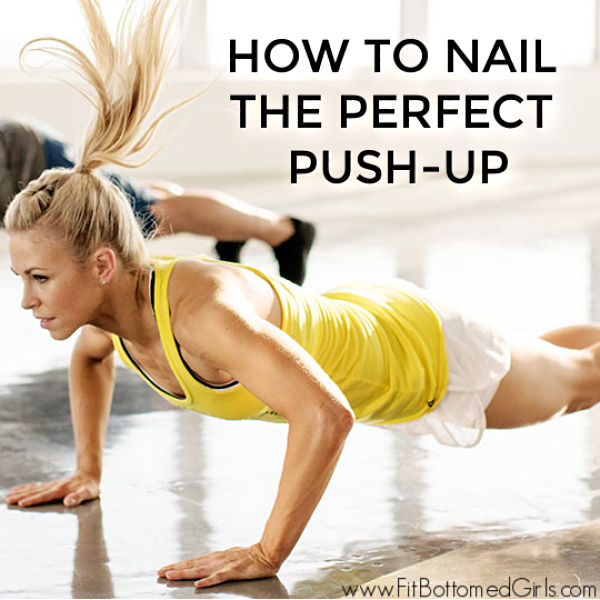 Bust out push-ups with perfect form. And we’ve got tips for doing just that (because, yes, you CAN DO IT!) from Les Mills on Demand. Les Mills Presenter Erin Maw suggests that you also concentrate on your breathing. If you’re struggling to do push-ups, new research shows that dropping to your knees is a highly effective alternative. Gottschall suggests you follow this 16-day push-up challenge and you’ll safely progress from knee to toe push-ups in no time. Mistake #1: Doing push-ups on your knees with your feet up in the air. Essentially this grinds your knees into the floor and it can cause instability, too. When you are forced to focus on staying stable, it can be more challenging to isolate the push muscles and build strength. Rather than keeping your feet dangling up in the air, place your toes solidly on the floor. Mistake #2: Doing push-ups with your arms in the T position can cause you to struggle and fatigue faster. Instead of thinking of a T, it’s a good idea to replicate a position that’s closer to an arrow shape. When your arms are in the arrow position, the hands are in line with the center of the chest and the motion is within the line of action of the pectorals. This allows the bigger chest muscles to take over and the shoulder muscles are used for stabilization — and it becomes easier to do the push-up on your toes. The Different Types of Push-Ups: What’s Right for You? There’s no dispute that the most effective push-ups are those done on the toes, as they engage a greater amount of activation in the muscles of the upper body and core — demanding whole-body integration. However, push-ups on the toes can be pretty challenging, and many people — especially older adults or individuals new to exercise — cannot safely complete multiple push-ups on their toes. All too often the hips and neck are not aligned properly and, consequently, the risk of injury outweighs the rewards. Whether it’s on your knees or toes, push-ups are definitely a move worth mastering. Not only are they a fundamental strength training move, but also they are featured regularly in HIIT workouts such as LES MILLS GRIT and various cardio workouts. Aspects of the plank and push-up are also common in yoga and Pilates-based workouts such as BODYBALANCE/BODYFLOW. Thank you Jenn! I have always struggled with push-ups. Now I see that I have been making both of these common errors–toes up in the air and arms too far forward. I’m almost looking forward to trying some push-ups with these form corrections. Always pleasure to go through your blogs! Here we have curated few reasons which explain why abs workouts are important.